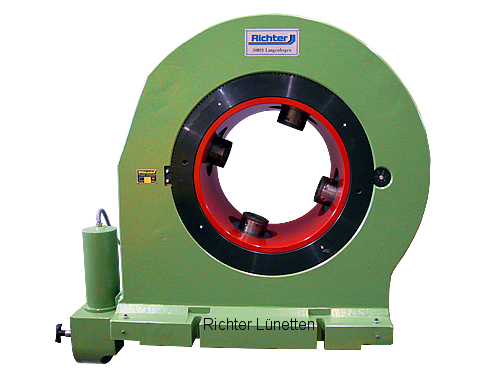 The ring Steady Rest is similar to a four-jaw chuck, which is placed axially onto the bed, for example, in order to achieve the following: A long shaft has been bored out and the workpiece is still unworked on the outside. The boring should remain straight and not to be moved. A Steady Rest seating is not swivelled in, rather the Steady Rest is positioned axially on the workpiece as a support. The boring location is checked using appropriate resources and corrected by bracing in the Steady Rest. Following this, work is implemented from the right and left up to the Steady Rest. In the case of this workpiece type, it is important that the wall-thicknesses remain within maximally tight tolerances.